Service-learning is a form of experiential education. In a service-learning project, students utilize what they have learned inside the classroom to solve community problems. The learning process occurs through a cycle of actions and reflections, where students gain deeper understanding of the knowledge learned, the real world, and themselves (Eyler & Giles, 1999). Service-learning brings together students, instructors, and community partners and benefits all parties by putting into practice the knowledge taught and learned in the classroom through meaningful service and critical reflection (Kuh, 2008). As a pedagogy, service-learning emerges from the experiential learning theory. It encourages active student involvement in the learning process and is a high-impact educational practice. Various research studies have provided empirical evidence that service-learning has positive impacts not only on student academic outcomes but also on their self-efficacy, leadership ability, and future career plans. For example, Astin, Vogelgesang, Ikeda, and Yee (2000) conducted a study using data from college entrance and exit cognitive and affective development surveys of undergraduate students across three different campuses. They found that service-learning strongly enhances students’ understanding of the course materials and increases their degree of interest in the subject matter. Moreover, they discovered that the practice of service-learning has positive effects on student academic outcomes, values, self-efficacy, leadership, career plans, and plans to participate in further service. Upcraft, Gardner, and Barefoot (2004) found that service-learning enhances students’ first-year experience. Waterman (2014) also claimed that the experience of service-learning offers students a distinct approach to apprehending the course content and allows them to appreciate the value of the class by observing how the knowledge learned in the classroom has real-world applications and how it makes a difference in people’s lives. Similar results have been found in the meta-analysis conducted by Celio, Durlak, and Dymnicki (2011). To incorporate service-learning into a course, instructors are encouraged to start small and gradually add this component to the curriculum step-by-step. It does not require a major service-learning project or a substantial amount of work to make an impact on the student’s learning experience. Research shows that even a small-scale, short-term service-learning experience adds significant positive values to students. Reed, Jernstedt, Hawley, Reber, and DuBois (2005) reported that students involved in a small-scale service-learning experience of eight to 10 hours demonstrated better maintenance of the sense of social responsibility, as well as an increased sense of meaningfulness of college and likelihood of choosing a service-related occupation in the future, compared to their counterparts who did not have such an experience. The authors concluded that service-learning programs do not necessarily have to be time-consuming or resource-intensive. Even a small-scale, minimally resource-intensive service-learning project can offer students with similar benefits as a resource and time-intensive project would. Furthermore, as the educational paradigm shifts to more online courses, service-learning becomes more important. It provides a key element to connect students to the real world and links their learning to application. Strait and Sauer (2004) asserted that as the trend of distance learning continues, “students will be looking for ways to gain work experience and build long-lasting partnerships with their communities that will benefit their future careers. The (service-learning) experiences provide rich, authentic, hands-on training for students” (p. 64). At our university, service-learning is highly valued and strongly encouraged. Chaminade University of Honolulu (CUH) serves a diverse student body, including Native Hawaiians and other Pacific Islanders, with a mission driven by Catholic Marianist values. The five characteristics of Marianist education are: (1) educate for formation in faith, (2) provide an integral quality education, (3) educate in family spirit, (4) educate for service, justice and peace, and (5) educate for adaptation and change. Therefore, service-learning is Chaminade’s mission statement in action. The University has received various awards and recognition for its dedication to service-learning and community engagement, including the Engaged Campus Award from Campus Compact (Western Region), the Environmental Community Hero Award, and the Partnership in Education Award. We are honored to have received the Presidential Award, and special recognition on the President’s Higher Education Community Service Honor Roll. The Presidential Award is the highest federal recognition that any college or university can receive for its commitment to service-learning and civic engagement. The University has been recognized by the Hawaii State Legislature and the City and County of Honolulu for our commitment to serving the community as well. Also, many of our students and faculty members have received individual recognition and awards for their contributions, especially in supporting lower-income families in the local community. Three examples of our ongoing service-learning programs are presented in the next section, including two programs helping the elderly and resource-limited individuals and families, and another program promoting economic literacy among the next generation. In response to federal policy changes that increased strain on immigrant communities, a citizenship tutorial program was born in Honolulu in 1996. A grassroots community organization, the Chinese Community Action Coalition, was at the helm, engaging faculty and students from Chaminade, the University of Hawai‘i at Mānoa, and Kapi‘olani Community College. Today, the program thrives as part of a national service-learning initiative called Project SHINE, “Students Helping in the Naturalization of Elders.” This program involves students assisting elderly and resource-limited permanent residents through the United States citizenship process. Chaminade trains students from all three campuses to assume the role of tutors, providing civics and English-language acquisition assistance to learners, no matter what their level of English proficiency may be. Our students find the program very meaningful, not only for those whom they help and build relationships with through the tutorial but also for themselves. Giving back to the community and making an impact on other people’s lives give students a sense of fulfillment that often brings them back to service in future semesters. Students also develop leadership skills. SHINE’s built-in leadership opportunities enable our best tutors to return to the program as experienced mentors for new volunteers and managers of the program. For example, one of our coordinators mentioned that SHINE “facilitates a safe and beneficial relationship between learners and tutors as they share cross-cultural experiences and learn about each other.” When asked how the program influenced her life, the student said that the program improved her Cantonese-speaking skills and, more importantly, transformed her from a shy person to someone willing to reach out and engage with others. She feels accomplishment and joy every time she sees the people she tutors finally understand and be able to utilize the new skills learned in their everyday lives. Project SHINE has received the prestigious E Pluribus Unum Prize for its work in promoting immigrant integration and building stronger communities that define the future of our country. Our accounting and business students who enroll in tax classes have assisted the elderly, homeless, and lower-income communities for over 20 years by providing free income tax preparation and personal budget planning assistance. The current partnership with Volunteer Legal Services Hawaii began in 1998. Each tax season, clinics are offered at eight different homeless transition shelters, two domestic violence shelters, and the only emergency homeless shelter on the island of Oahu. Students are tested by the professor using IRS competency standards before going into the field and offering federal and state tax-filing assistance for individual clients. By participating in this project, students develop their technical and accounting skills by doing tax returns, as well as improve other skills including interpersonal communication, analysis of tax law issues, and collaboration with other professionals. All of this prepares them for their future careers. This program consistently receives positive feedback with a high level of satisfaction from the people we have helped. Regarding the impact on the community, records indicate that this project has facilitated and aided individuals and families to receive an estimated total amount of over $500,000 in otherwise non-claimed refunds each year. Over the lifetime of this collaboration, that would amount to more than $10 million in returns for eligible individuals and families. The Economic Literacy for Elementary School Students Program is a joint project with the Hawai‘i Council on Economic Education started in January 2018. This project involves undergraduate students from introductory-level economics classes. 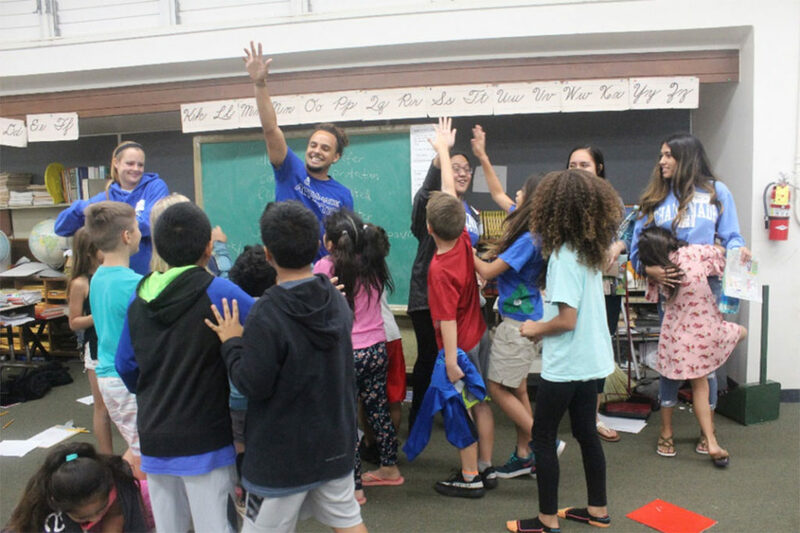 The students visit multiple local elementary schools on the island of Oahu and teach second and third-grade students about basic economic concepts including scarcity, goods and services, specialization, producers and consumers, economic needs versus wants, and human resources. After being taught these economic concepts, the elementary students draw pictures to show their understandings of these concepts. These students are later encouraged to submit their pictures for a calendar contest named Economics through the Eyes of Children; winning pictures are printed on the next year’s calendar. We always observe increased interest, lifted spirits, and smiling faces from both the elementary students and our college students after a day of teaching and learning. Results from the post-project student survey show that 100% of our students strongly agree that participating in this service-learning project helps them better connect what they learn in the classroom to real life, and completing this service-learning project improves their relationship with classmates and the professor. All the participating students agree that they have learned something new about the community through this experience. Also, all of them state that they will strongly recommend this service-learning opportunity to other students. Besides these three programs above, we provide many other service-learning projects for our students at the University across different disciplines. We offer campus-based projects, shelter-based projects, and other projects featuring cultural diversity and the perpetuation of Native Hawaiian traditions and values. More information about our service-learning programs at Chaminade University of Honolulu can be found on the university website at https://servicelearning.chaminade.edu/find-a-project. We hope these materials will provide useful insights for our readers who are interested and planning to bring service-learning to their classes. Picture above: Students from Chaminade University of Honolulu visiting a local elementary school during the Economic Literacy for Elementary School Students Program. Service-learning helps to bridge the real world and the classroom. Research has shown that service-learning is effective as a method of teaching and as a means of learning. It helps improve students’ test scores, attendance, self-confidence, and sense of social responsibility, and so on. It also helps students build critical thinking and communication skills and promotes civic engagement while allowing students to test and apply what they are learning in the classroom. As educators, we believe that education is not just about conveying knowledge in the classroom, but also—and even more so—about fostering and nurturing character. Service-learning is instrumental in achieving Chaminade’s mission for students—to encourage the development of moral character and personal competencies in preparing them for life, service, and successful careers. We thank Dr. Mary Therese Perez Hattori, Associate Professor and Director of the Center for Teaching and Learning at Chaminade University of Honolulu, for her valuable comments that help improve this manuscript. Astin, A. W., Vogelgesang, L. J., Ikeda, E. K., & Yee, J. A. (2000). How service learning affects students. Higher Education Research Institute, Paper 144. Los Angeles: University of California, Los Angeles. Celio, C. I., Durlak, J., & Dymnicki, A. (2011). A meta-analysis of the impact of service-learning on students. Journal of Experiential Education, 34(2), 164-181. Eyler, J., & Giles, Jr., D. E. (1999). Where’s the learning in service-learning? San Francisco: Jossey-Bass. Reed, V. A., Jernstedt, G. C., Hawley, J. K., Reber, E. S., & DuBois, C. A. (2005). Effects of a small-scale, very short-term service-learning experience on college students. Journal of Adolescence, 28(3), 359-368. Strait, J., & Sauer, T. (2004). Constructing experiential learning for online courses: The birth of e-Service. Educause Quarterly, 27(1), 62-65. Upcraft, M. L., Gardner, J. N., & Barefoot, B. O. (2004). Challenging and supporting the first-year student: A handbook for improving the first year of college. San Francisco: Jossey-Bass. Waterman, A. S. (2014). An overview of service-learning and the role of research and evaluation in service-learning programs. In A.S. Waterman (Ed. ), Service-learning (pp. 15-26). New York: Routledge.